We were married at Scripps Seaside Forum so Dano’s Island Sounds was absolutely perfect for our ceremony and cocktail hour. I choose him after watching a video on him playing “Clocks” by Coldplay on youtube. I still go back to that video to watch it. It’s just amazing. That was the song we played when the ceremony ended and it was perfect. Dano was professional throughout the planning process. We decided to just go with him with no vocalist or any other instruments and it worked out perfectly. We had tons of compliments from the guests about how amazing Dano was. I’m only upset that I was so busy during cocktail hour that I couldn’t sit back, relax, and enjoy the music! He really is amazing and well worth hiring for any event! Not only was he just a NICE GUY and a pleasure to work with but he MADE OUR DAY!!!! The one thing we have continuously gotten the most compliments about is our music. He was able to blend a large genre of music together to appease my 93 year old grandmother as well as my 2 1/2 year old flower girl! And when there were a few hick-ups in the reception he just covered it right up so no one even knew. He played live as people entered the venue, switched to recorded music for the ceremony, played live steel drums with a guitarist and vocalists for our cocktail hour and then switched back to recorded music/DJ style for our reception. HE WAS FANTASTIC!!!! We had Dano solo on the steel drum for our wedding ceremony and cocktail hour. He was wonderful! Our ceremony was outside by the water and it just fit perfectly. His cost was very reasonable, he was very easy to work with and he sounded fantastic. All of our guests were very impressed with what a difference it made having him there playing. We will find reason to hire him again for something in the future. I would recommend Dano's Island Sounds to everyone. 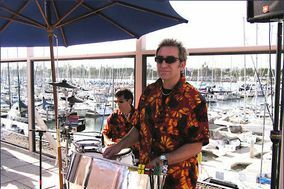 These guys put on a great show, i loved the steel drum music as i walked down the docks for my ceremony. It could not have been more perfect. They were all matching and sounded wonderful, they really had everyone enjoying dinner with soft carribean music, and when it was time to dance they brought it on!! I requested a couple of other songs through an ipod and they delivered. I was thouroughly impressed and have recomended them to many people! Dano Island Sounds was the perfect music option for our wedding overlooking the ocean. The steel drum & guitar duo (Dan & Craig) were BEAUTIFUL. After cocktail hour, they took over as DJs and did a great job keeping the dance party going and taking requests from my friends. I did not expect there to be some much dancing but everyone had an awesome time! I'd recommend Dano to anyone! I had the duet, with Dano and a guy on guitar. They were awesome on the steel drums, great personality. Loved em!